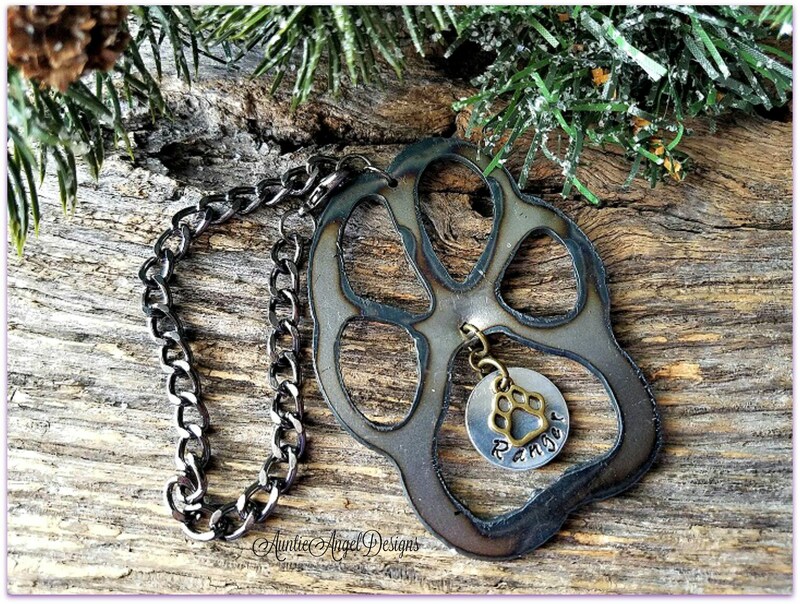 Your favorite paw print memorial ornament, offered now in a raw metal finish! By request, a non-beaded paw print ornament for the man with a grieving heart. 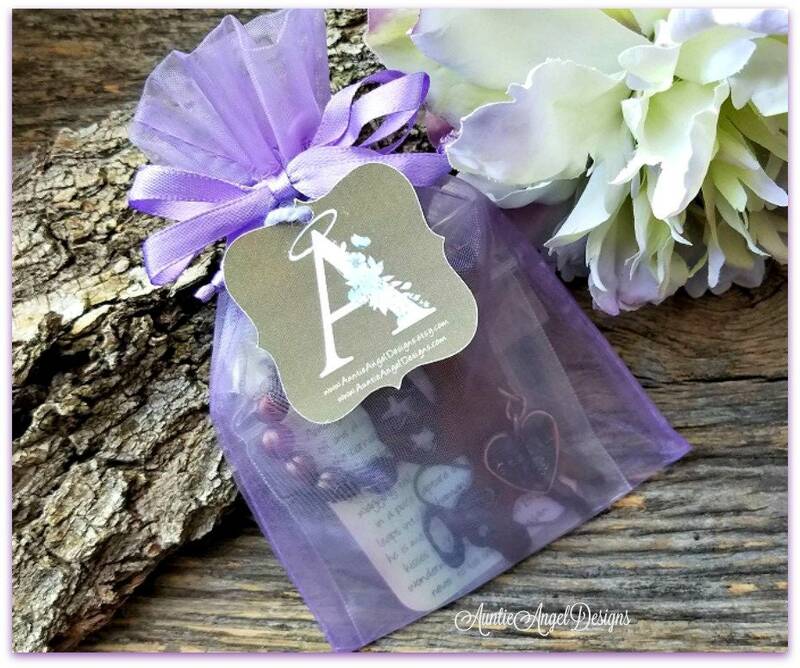 This paw print ornament is a unique and exclusive pet sympathy gift by Auntie Angel Designs that makes a great year-round remembrance piece. 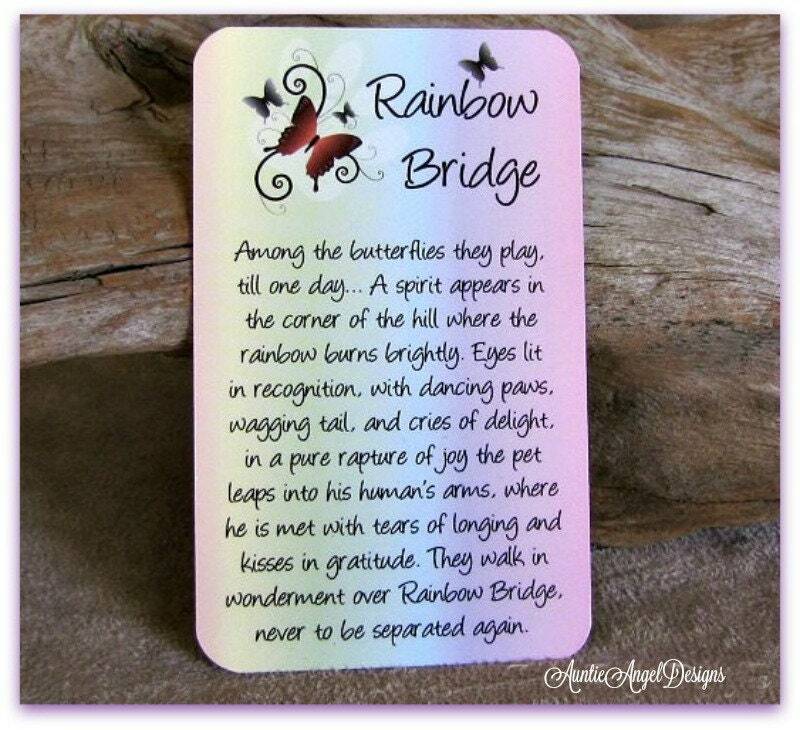 This gorgeous, yet simple steel paw print ornament is meant to remind you, or him, always of the precious companion. Each open paw print cutout is made of raw 16-gauge steel and is 2.25" wide by 3" tall with the thickness of about a quarter. 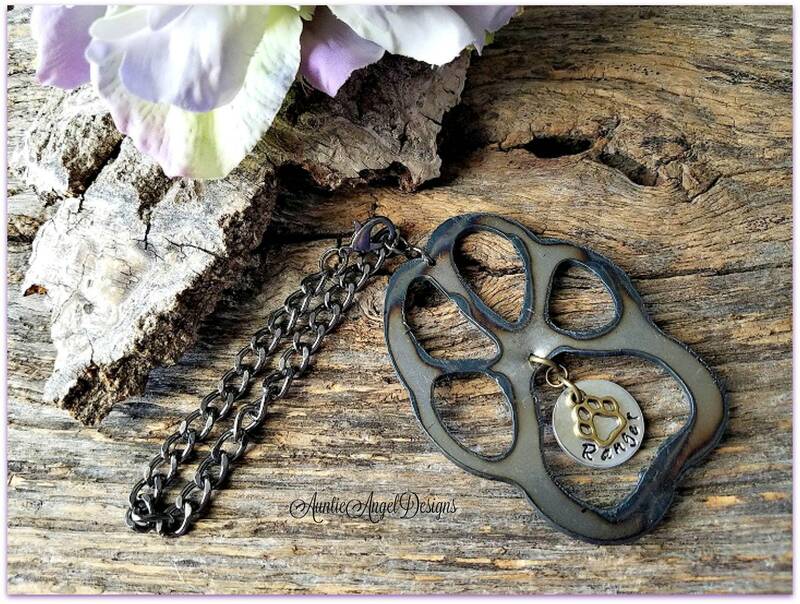 The paw print dangles from a gun-metal-finish chain with a lobster clasp in case hanging it from a car's rear-view mirror is desired. This ornament's total length including the metal paw print is approximately 6-3/4" long. The paw print ornament is NOT meant to be displayed outdoors and is NOT water-resistant or waterproof. Each piece has been triple clear-coated to preserve the richness of the steel coloring and burn pattern from the saw, which varies from ornament to ornament. Please note that each ornament is unique. Please allow for slight variations in the hand-cut metal and note that the cutouts within the metal do leave a rough edge on the back and the slag has not been cleaned off. 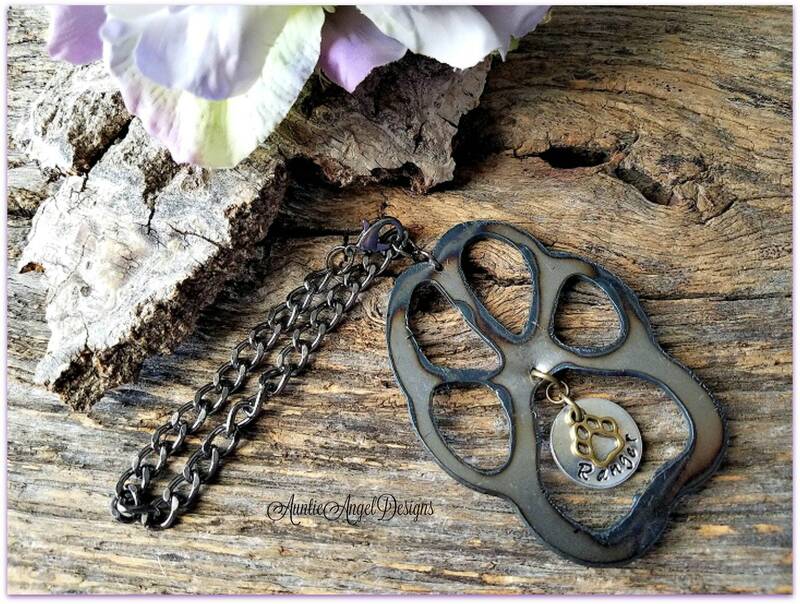 For an additional charge, I can personalize this piece with the pet's name stamped on an aluminum disk topped with an open brass paw print charm. A name can be stamped with a year, if desired, provided the letters and/or numbers do not exceed 13 characters, including spaces. Stamping occurs on only one side of the disk and does leave a slight imprint from the stamping on the back. This is normal with hand-stamping. Note that this disk is NOT a perfect match to the ornament, but it is a nice complement to it. As each letter is hand-stamped by me, letter by letter, or number by number, alignment and spacing may, and most likely will be, slightly off, which is the beauty of a custom hand-stamped piece. The name will NOT look like it has been engraved by a machine. 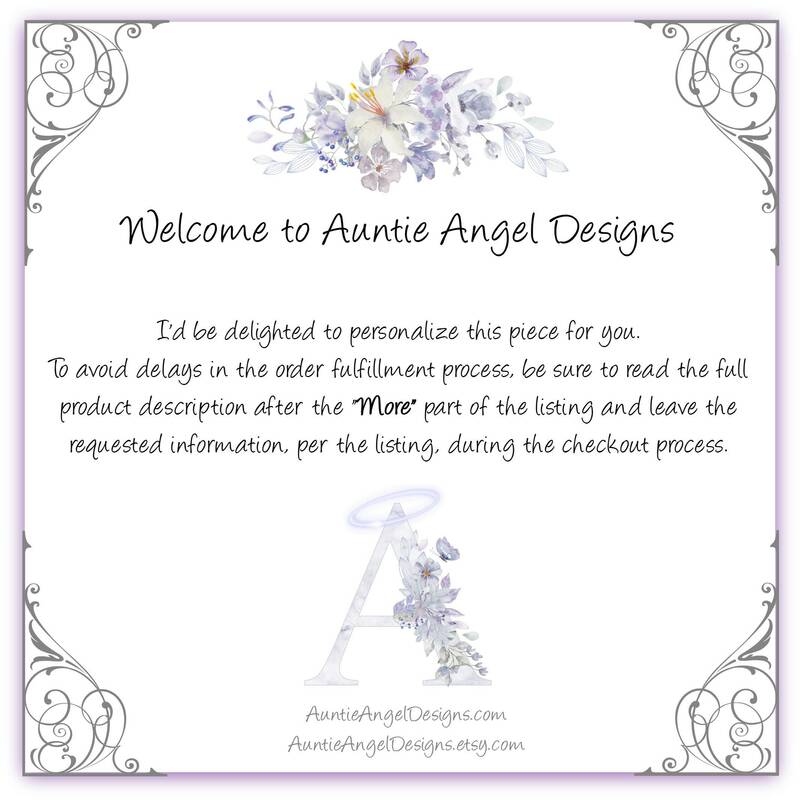 * * * * PLEASE LEAVE THE PET'S NAME (or name and year) IN THE NOTE TO SELLER BOX DURING THE CHECKOUT PROCESS IF NOT PROMPTED BY ETSY FOR PERSONALIZATION.